Stock splits are corporate events where the number of shares in circulation changes as well as the price -per-share. If we own 100 shares at $50.00 per share pre-split and the stock splits 2-for-1, then we will own 200 shares at $25.00 post-split. The value of our position ($5000.00) does not change. This is a reduction in the number of corporate shares along with a corresponding increase in share value. In the above example, a 1-for-2 reverse stock split would result in owning 50 shares at $100.00 per share, still a $5000.00 total value. Why would a company promote a reverse stock split? There are several reasons this would make sense, none of which would encourage us to own the stock or exchange-traded fund (ETF). On July 12, 2016, as share value has plummeted to $7.00 per share UVXY announced a 1-for-5 reverse stock split. The effective date for this split was 7/25/2016. Share price on the 25th was about $6.00 per share so for every 100 shares owned pre-split, 20 shares at $30.00 would be the new position post-split. The position value does not change at the time of the split but $30.00 is more cosmetically pleasing than is $6.00. How does a reverse split impact our options? In addition to the newly adjusted contracts (UVXY2), the exchanges begin introducing non-adjusted contracts based on the new market pricing. This creates a scenario wherein some contracts deliver 100 shares while others deliver 20 shares (I’m even getting a headache from this… however, in the interest of education we push on. When adjusted contracts exist along with standard contracts (100 deliverable), there should be some sort of indication as to which is which. In this case, adding that “2” to contract symbols with an explanatory footnote would do the trick. However, that’s not always the case. 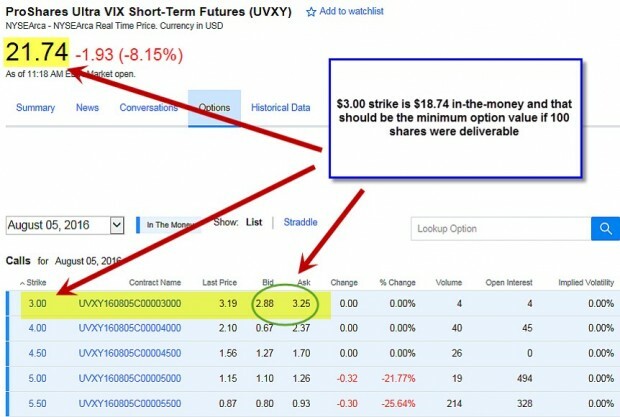 In the screenshot below, the options chain shows a $3.00 strike trading between $2.88 – $3.25 for a stock trading at $21.74. For standard contracts, that is impossible as there is at least $18.74 in intrinsic value. That’s how we know that this is an adjusted contract. Reverse stock splits are generally corporate maneuvers designed to give the appearance of safe, secure and reliable investments. These events will result in contract adjustments for our options and these changes do not always fit one specific formula. It is important to understand the implications of these changes and to carefully view options chains that may not discern between adjusted and non-adjusted contracts. Asking ourselves if the premium amount makes sense for a standard contract will get us to the correct understanding of the contract type. BCI: I am currently fully invested and have an equal number of in-the-money and out-of-the-money strikes. The 6-month charts point to a bullish outlook. In the past six months, the S&P 500 was up 6% while the VIX (11.44) declined by 35%. Is there a service or website that provide a list of stocks that will be splitting or reverse-splitting? The server for the member site is being replaced with a larger server. The member site will be down for a short time this morning and perhaps into the afternoon. My team is working to minimize the down time for this enhancement. This week’s Weekly Stock Screen And Watch List has been uploaded to The Blue Collar Investor Premium Member site and is available for download in the “Reports” section. Look for the report dated 12/23/16. Last Monday I bought 500 shares of nvda at 100.50 and sold 5 january 105 contracts for 2.50. Today the stock is trading for 116.58 and it would cost 13.50 to buy back my options. Is this a good move or is it too early to buy back these options? A case can be made for both perspectives but in my view, it’s too expensive to close and a 7%, 1-month return with huge downside protection is much too tempting to take off the table for an opportunity to beat a 1.9% return in the remaining weeks to expiration. I would take no action but more aggressive investors may look to generate even higher returns. Commenting on John’s Blog article where he bought 500 shares of nvda at 100.50 and sold 5 january 105 contracts for 2.50. Today the stock is trading for 116.58 and it would cost 13.50 to buy back my options.ell NVDA. I have found a quick way of calculating for a roll or other BTC transactions is to use the BEP Break Even Point as a reference point to make the math calculations and comparisons quick on paper. C. Comparison 7% -5.1% = 1.9% loss if do the BTC. Some tips from actual trading experiences. Just thought it might be a good tip for future years to remind your membership near the November Expiration Friday that 2-4 % cash reserve will not be enough cash reserve to cover your Required Minimum Distribution for the year if you are in an IRA account. Most retirees have it paid out in December. I had one scheduled for Dec. 15 and lucky I bought back a trade on Dec. 14 and it bounced back saying I did not have enough cash. Fidelity was able to cancel the transaction that same day. Otherwise I would not have enough cash to make a buy back and would had an option exercised for Expiration Friday 12/16. Tip2: Resolving a problem with an accidental Covered call STO trade to the wrong account when you have both a Retirement and Non-Retirement account with the same broker. I have two accounts with Fidelity, one a Retirement and another an IRA. I strive to keep 4% reserve for buy backs in both sometimes it is larger. I had a case where I needed to use up my cash to reduce the reserve by $5000. My default was the Non-retirement account. I placed a Covered Call STO trade around 3:55pm. When I went to document my portfolio cash later in my Yahoo and Excel Spreadsheet portfolios I noticed the Fidelity account had less than $200 cash balance. That meant I could not use any exit strategies later! Well, Fidelity resolved the matter by making an internal processing transaction to move the funds to the Retirement account. Problem solved. This might be a policy with all brokerage houses as a customer service. This happened to me one other time but in that case I had to unwind another position so it was a non-issue. Tip3: Watching out for those Option chains with a Bid of 0 and a Mark premium with 1/2 the Bid to Ask price and how your broker might be able to help for a bad trade. GS has been on an impressive price run since the beginning of August. As a matter of fact, the entire financial sector, including banks and broker-dealers, have been on a tear since the election. Despite the run up in price, GS still trades at a forward PE under 16, below market average. This stock has had 4 consecutive earnings :”beats” and has only one “miss” in the past 5 years. Our 1st quarter, 2017 Blue Chip Report shows that in the past 3 months, GS has increased in price by 43% compared to the S&P 500 which is up 6%. In the past one year, GS has appreciated by 35% while the S&P has moved up by 11%. The chart below shows a moving average crossover in the beginning of August that has resulted in a price increase of nearly $90.00 per share. Do you look at the probabilities otm to decide which option to choose when writing or do you simply go with your % of return that you would like? The probability of a strike expiring in-the-money is definitely not my main focus. I first decide on the “moneyness” of the strike (ITM, ATM OTM) based on chart technicals, overall market assessment and personal risk tolerance. From there, I check the option chains to see which strikes meet my personal monthly goals (2-4% for initial returns). The overall concept is to generate monthly cash flow (or Weekly in some cases) and to put ourselves in the best position for success. Once that trade is entered, we now focus in on position management opportunities. I come from a background in forex and trading complex options such as Iron Condors, Iron butterfly and credit, debit spreads. In trading such options I would never even get close to the expiration time, taking %50 profit for small gains. Writing covered calls one of the reasons i liked the strategy was the idea of letting the Call get assigned, a kinda hands off approach if things go well and saving money on option fees. I have a small account just over 15,000 so fees are a big deal to me. I use TD Ameritrade and i discovered that they charge a huge $19.99 fee for assignment! I did not realize this, and even your pdf on broker fees doesn’t show this. I’m upset because TD Ameritrade is one of the highest commission out there $9.99 a trade .75 contract. Should i change brokers or is this 19.99 fee something i should just deal with and not ever get a assigned? or try to not get assigned. What do your members and you yourself recommend in a broker for covered call writing? We should never tailor our strategy around broker commissions but rather select a strategy that meets our goals and then select an appropriate broker for that strategy. 1- Call your contact at TD Ameritrade and ask for a reduction in exercise fee. Explain (they already know this) that other brokerages simply charge a standard trade commission. They may not comply but you never know…it’s worth asking. 2- Find another broker. Our broker file is a good start and has all the contact information. Many of our members use Interactive Brokers because of their very low commissions but they may have other requirements that may not meet your goals…again worth asking. There are several choices on the list with reasonable commissions. you not going to believe this but I called TD Ameritrade like you suggested. right away he put in the paperwork to get stock to 8.95 and assignment fee crushed to $8.95!!! I should here back from them Tuesday. I think they feel like they better hold on to people wile they got them. Please feel free to use my example on how to deal with crazy fees, thank you for your help. Way to go Alan B.! Another suggestion I had success with is if you do move an account to one of the better discount on line brokers and then sometime down the road you see they offering an attractive offer to new accounts they were not offering when you joined call them up.point out you are a loyal customer and got no such offer. I opened a substantial – for me anyway – account with Options House a few years ago. Subsequently I saw they were offering 100 free trades to those funding new accounts. I called them up, said I never got that, they looked at my account and grand-fathered me into the offer.